Sign up for a free trial of Outline 4D for Windows now! Outline 4D software has limitless space for your big ideas. Take your outline to the next level! 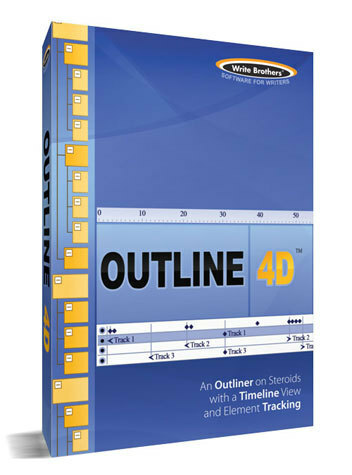 With limitless space for your big ideas, Outline 4D provides a visually stunning horizontal timeline that lets you visualize your project’s structure, along with classic outlining tools that speed the process of brainstorming and creation. See how Outline 4D can change the way you prepare and organize your project. Outline 4D's Outline window provides a familiar word processor interface that lets you write in a familiar top-to-bottom manner, similar to other outliners. Each bullet-point in an outline is called an Event. Add and remove events, edit them, promote or demote them (change their indent in the outline), move them around the outline, and selectively hide or show portions of the outline. Get to know the basic features and you'll be an outlining pro. It's easy. Outline 4D lets you create the elements of your project and arrange them on a timeline. See what events make up your project, as well as how many minutes (projects, movies, Television) or how many pages (novels, other stories) each event occupies. Zoom back for a full panorama of your entire project and ìsee the forest for the trees, or zoom in to focus on the smallest detail. Take spontaneous ideas and place them at any point in your project's timeline - even if you don't know what comes before or after that piece! Add the building blocks of your project in any order and immediately see any gaps! Outline 4D's hierarchies let you organize your project from the broadest strokes down to the smallest detail. You can visualize structure using almost any writing system developed. Levels, tracks and event names are configured easily by you, making it simple to follow the methods of your favorite writing instructor. Build templates from which to develop your project, or use any of the pre-made templates that come with Outline 4D. Visually track almost any kind of information in your project, such as people, places, benchmarks, ideas virtually anything you want. Outline 4D even can search your project for specific keywords and make connections automatically as you write! Click a button and Outline 4D highlights portions of your project connected to selected tracks. Instantly see where specific items or concepts appear in your project. It's the ultimate way to get an overview of your project. Outline 4D lets you print wall-sized maps of your project. You decide the number of pages you want your project to fit on from a single sheet to many sheets, depicting the timeline of your entire project. You can even print your project's timeline on a large, continuous sheet of paper using a large format printer (available at many copy centers). Of course, Outline 4D also prints standard reports that show the text of your project in standard outline form. For the screenwriter or playwright, Outline 4D can take your project text and with the click of one button export it to Write Brothers Movie Magic Screenwriter, the most powerful screenplay word processor available. Within seconds your script is automatically paginated according to professional screenplay standards, ready to print and distribute to readers.